This school chapel in Rutland area exhibited the classic signs of corrosion to the mild steel reinforcement causing parts of the stone section to break off. Reconstituted stone is a very command and widely used alternative to natural stone. To the untrained eye reconstituted stone looks very similar to the real thing, but in fact, contains mild steel reinforcement and is made in a similar manner to pre-cast concrete. 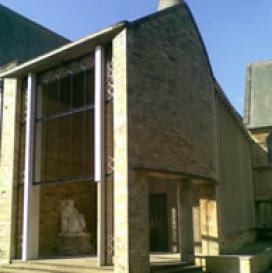 Concrete Renovations Ltd treated the steel reinforcement with a rust inhibitor and carried out repairs to various stone sections on the exterior of the chapel using our colour matched, cementitious restoration mortar to provide a long lasting repair which is sympathetic to the adjacent stone.